As for the term “SPAM” this has been around for some time and it stands for “Self Promotional Advertising Message” so you should know what is intended by the concept. Before the Internet arose SPAM referred to junk post received in our letterboxes, as leaflets and other marketing materials. The web brings with it a new form of “junk mail”, and those of us using email on a regular basis will recognise it. Spam is what you receive into the junk part of your inbox. The material refers to unsolicited advertisements and marketing materials, much in the same way as you would receive marketing materials and leaflets into your real letterbox. Junk mail can be annoying, as can real leaflets and pieces of paper you have not requested in your letterbox. One of the problems faced by the law enforcement officials of each country, no matter where they come from is that laws have not kept up to technology and its speed of progress. For example, the 1968 “federal wireless act” in the US did not include email as part of its rule set, and this has yet to be amended. This is true of other countries who have yet to implement laws regarding internet communications or have just not got round to even considering it. 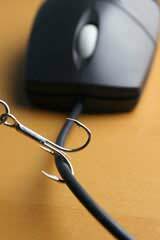 Phishing attacks consist of lookalike websites which have the devious intent of stealing identities or cash from private bank accounts. This is achieved by sending out realistic emails which appear to be from a genuine source like a banking organisation. The emails usually contain links to websites which look like the banking organisation concerned. The user is then fooled into entering their bank account details which are then stolen by the attacker. One of the scams involves various “Nigerian” scams are well known, both in emails and on auction sites like eBay. The aim is to obtain goods or cash by false pretences. Some of these are quite well known such as the “419” scam which originated in the early 1980’s. Obtain free toolbars from organisations like Earthlink, Netcraft, Mozdev.org and Cloudmark.